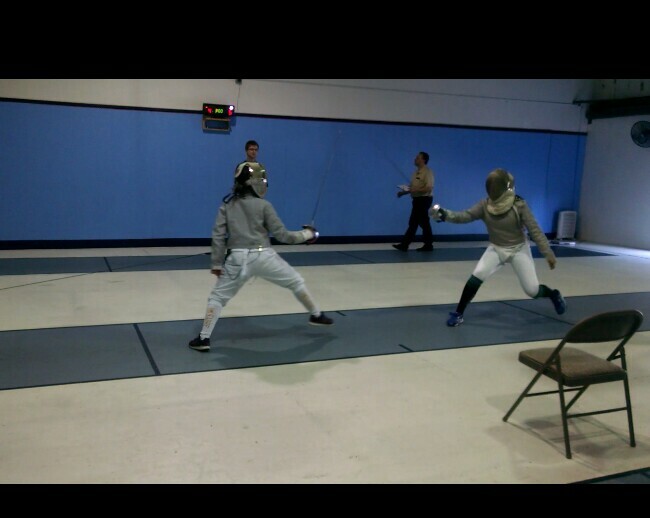 Janie (left) attacking in Youth 12 Sabre at the 2016 Coastal Clash in Chesapeake, Virginia. The Salle Green LLC Athlete’s Handbook provides guidance for our Salle members on Salle policies governing fencing in the Salle and in competition. Members are expected to abide by Salle policies as a condition of membership. We expect all fencers to exhibit good sportsmanship, conduct themselves with honesty in sport, work as teammates whether they are competitors or recreational fencers, and uphold the Salle’s status as a Center of Excellence and Club of Excellence. 1. Annual Training Plan: Each year fencers complete an annual training plan at the Competition Camp or by individual consultation with a member of the coaching staff. This plan is updated as needed during the year to provide specific goals for the fencer’s training. a. Planning: All classes will be lesson planned, and a copy of the lesson plan for each class or individual lesson will be retained on file. Individual scheduled individual or small group classes – these may be training, teaching, bouting, or other specialized format lessons. Team training to develop team cohesion and understanding or competition doctrine and to conduct conditioning, tactical training, and special skill development. Short lessons – 3 and 5 minute tactical and technical lessons used in Open Fencing. c. Class Management: All classes and lessons start on time and end on their scheduled time to the greatest extent possible. Standard class length is one hour. We do not delay classes or repeat material for the convenience of individuals who arrive late. Classes will include warmup as appropriate, technical or tactical instruction, and for group classes bouting for application training. d. Salle Blog: The Salle Blog on the Salle website provides background, technical, and tactical information on the subject of each week’s classes. Members are responsible for reading the Blog to be prepared for the lesson before they come to class. We will not repeat material in the Salle Blog in class. 3. Uniform: The Salle Uniform as worn by fencers representing the Salle in competitions is intended to present a common appearance among our fencers that projects adherence to the traditions of the sport, minimizes visual signatures that could aid opponents, is distinctive without being gaudy, and communicates our efforts as being those of serious athletes. a. Warm-Up Suit: The Salle Warmup suit is a combination of pants and jacket, colored green, black, and white, with white lettering “Salle Green” on the left side of the chest and left leg, and white lettering identifying the weapons squad (“Foil Squad,” “Epee Squad,” “Sabre Squad”) on the right chest. On the back of the jacket at shoulder level will be white lettering “Salle Green.” Professional coaches will wear a black warm-up suit with white trim and green lettering, including lettering on the right chest identifying the professional rank of the individual. b. Fencing Uniform: The uniform will be white in color. On the jacket on the non-weapon arm, the Salle patch will be worn at the shoulder approximately 1 inch from the arm seam and centered on the sleeve. The Pan American Fencing Academy or Classical Academy of Arms skills patch will be worn on the non-weapon arm approximately 2-3 inches above the lower end of the sleeve. Name markings, when worn, will conform to USA Fencing requirements and may be either on the back of the jacket or on the non-weapon leg of the knickers. Stockings will be white in color, and of the Salle pattern. Fencers may wear the traditional Salle green shoe laces if they choose to do so. (1) Fencers in the Salle may wear plain black warm-up pants or the Salle’s warm-up suit pattern pants in place of knickers. Shorts will not be worn (unless otherwise permitted for coaching training sessions or team training) because of the hazard for leg injuries from an electric or broken blade. Form fighting tights, blue jeans, camouflage hunting pants, etc. will not be worn. (2) Beginning fencers may use Salle equipment for their first 3 months as a member of the Salle and may wear any pattern of athletic T shirt and pants while attending a beginner’s Primary course. After 3 months fencers are expected to have their own mask, glove, jacket, and underarm protector (plastron). c. T Shirt: Fencers will wear a Salle T Shirt, athletic grey in color with green lettering “Salle Green” in the current Salle pattern. Prior patterns of Salle T shirts may be worn until no longer serviceable. Trainers may wear the Salle pattern T shirt for their rank, and classical fencing trainers may wear the Classical Academy of Arms T shirt for their rank. T shirts will be worn tucked into the fencing trousers or knickers in competition and in the Salle. d. General: All uniform items will be clean and in good repair. Stained, dirty, and torn or frayed uniforms are not appropriate and will not be worn. Members are reminded that failure to wash uniforms weakens the protection the uniform provides, increases the probability of skin infections, and increases the probability of contamination of wounds in the unlikely event of a penetration injury. 4. Solo Training: For competition athletes, and on request by any member, the Salle publishes a weekly solo training assignment to help fencers develop foot and blade skills, endurance, strength, and speed. Members participating in solo training are expected to return the completed training worksheet each week. Failure to do so results in the fencer being dropped from the solo training program. Excuses that the fencer did the training but did not have time to record it on the worksheet will not be accepted. 5. Skill Development Programs: All members will participate in either the Pan American Fencing Academy’s or the Classical Academy of Arms (or both) skill development programs. Regular progress in meeting the practical skill and knowledge requirements of these programs is required. 6. Daily Bout Report: All fencers are responsible for logging each bout fenced on the daily bout report form maintained on the fencing floor. This form records number of bouts fenced, touches scored, and touches received. Each month a report is prepared and posted on the bulletin board on the Salle fencing floor totaling practice bouts fenced, victories and defeats, victory percentage, touches scored, touches received, indicators, and average number of touches by which the fencer wins or loses in a bout. Fencers are responsible for checking their monthly totals and using them to guide their level of activity to achieve training plan goals. 7. Use of Electric or Dry Weapons: We fence dry a majority of the time, including in individual lessons, class sessions, and internal competitions. This is a decision to increase the number of bouts we can fence and to make fencing more broadly available to our recreational fencers. The Salle can run 3 electric strips simultaneously, and in the week prior to a competition we encourage team members to fence electric for as many bouts as possible. As a courtesy and for safety we expect members to fence with dry weapons when fencing other members who are not equipped for electric fencing. 8. Use of Salle Weapons: Fencers are expected to acquire a practice weapon within the first 3 months of membership. Fencers who own their own weapons are expected to use those weapons in classes and in competition as appropriate. Salle weapons are available for beginners who do not have their own equipment and for fencers who wish to change their selection of grips. Classical weapons on the classical weapons rack are not to be used in modern fencing classes. Electric weapons are not to be used in classes unless the class includes electric fencing. Members who use Salle electric equipment in practice are responsible for testing that equipment on the conclusion of training and for any needed maintenance. The Salle will provide electric weapons to fencers in their first year of competition at a charge equal to the cost of testing and preparing those weapons for competition. Maintenance required as a result of damage in competition or practice will be billed at the cost of materials and labor. 9. Bouting in Classes and Open Fencing: All fencing in the Salle is conducted as practice bouts. a. Bouts Touches and Duration: Bouts are fenced for 5 touches (pool bouts), 1 touch (One Touch Epee), best of 3 touches (Lancet Epee), 10 touches (Veteran and Y10 direct elimination), or 15 touches (direct elimination). The last 30 minutes of two hour open fencing and the last 15 minutes of one hour open fencing should be used for direct elimination bouts to the greatest degree possible. Although bouts are not normally timed, they should be completed expeditiously to allow others to use our limited number of pistes. b. Refereeing: Fencers who are not actively fencing are encouraged to referee when requested by the fencers on a piste. (1) Immediately acknowledge any felt blade contact with their target area, including off-target area in foil. The individual receiving the contact may acknowledge the contact as a hit if sure of its validity. If there is any doubt, the individual whose blade landed may either definitively claim the hit or ask the fencer who felt the contact their impression as to whether or not it arrested. In the case that neither fencer is sure of the materiality of the contact, a doubtful hit is declared. If a fencer does not acknowledge blade contact with his or her target area the presumption is that a hit did not arrive. (2) Either acknowledge the validity of the hit based on the obvious right of way, or if uncertain ask the other fencer of their impression of the right of way. When fencing a member of coaching staff, a certified referee, or a significantly more experienced fencer, the other fencer will be guided by the opinion of the senior individual. In the case that neither fencer has a clear opinion of the right of way, a doubtful hit is declared. (3) Fencers will not engage in arguments over the materiality (whether a hit landed) or validity (whether the hit was on target and had right of way or priority) of hits or about the right of way. The action and hit are either clear and acknowledged or are doubtful and discarded. Persistent argument or failure to acknowledge opponent’s actions is considered an offense against sportsmanship. (4) Fencers are reminded that scrupulous honesty is required in self-refereeing. Claiming touches when blinded by a drive for one more victory in practice is counterproductive. The objective of practice is not victory but rather improvement. If a fencer claims a hit not earned, it cheats the opponent of learning which of his or her actions work, and cheats the fencer by creating a false expectation of excellence that will not translate to victory when a referee is present or in USA Fencing competition. And if a fencer denies a hit that clearly arrives, the reverse is the case. Persistent violations of this policy will result in denial of the right to fence bouts in class or in open fencing and may be cause for removal of membership. d. Adjustment for Conditions of Bouts: Salle members assisting with youth classes or fencing opponents who are significantly younger, less experienced, or smaller are expected to make appropriate adjustments in their game to allow the other fencer to learn from the bout. These bouts allow the more advantaged fencer to focus on the best possible execution of technique, synchronization of foot and blade, use of techniques not routinely practiced, relaxation, bout planning, etc. An adult fencer with experience beating a new to fencing 9 year old 5-0 in one minute teaches nobody anything that we want them to learn. e. Heavy Hitting and Keeping the Blade on Target: Heavy hitting is unpleasant and dangerous, with a real potential for injuring an opponent. It will not be tolerated. Fencers are expected to maintain a light hand and to bludgeon neither their opponents nor the opponents’ weapons. Persistent heavy hitting will result in withdrawal of bouting privileges in class and in open fencing until the individual can demonstrate appropriate technique. Leaving the blade on target to emphasize the hit is a statement that the opponent cannot be relied upon to adhere to our bouting guidelines, in effect a charge of cheating, as well as being incorrect training for a quick response to guard for self-protection in the bout. We expect that members will not continue to press a hit on target after its arrival. 10. Weapons Maintenance: Members are responsible for maintaining their weapons in good condition. During fencing fencers will check their weapons and straighten blades to eliminate excessive and S curves. After fencing every member will sand their blade to reduce the potential for failure and to control steel splinters. In the case of a broken blade, the fencer holding the weapon is responsible for meeting the cost of a new blade and its mounting. 11. Competition Selection: Fencers are responsible for monitoring the schedule of local, division, regional, youth circuit, and national events on the Fencing Results and Events Database and USA Fencing websites. Although we make a reasonable effort to ensure fencers are informed through our newsletter of appropriate competitions, the responsibility to monitor the schedule and select possible events that are consistent with the fencer’s goals and annual training plan rest with the individual. Fencers intending to compete in an event should always consult with the coaching staff to ensure the event is an appropriate one to enter to meet the fencer’s goals. 12. Pre-Competition: Each fencer is responsible for ensuring that his or her equipment is in good condition and that he or she has all the equipment needed for an event. This includes using the Salle’s competition checklist to ensure everything is considered, testing all personally owned weapons, body cords, lame, etc., and requesting any needed equipment at least one week in advance. 13. Security of Bags and Equipment: In the Salle and at competitions, every member is responsible for keeping his or her bag closed and stowed in the appropriate area. Bags will not be left open with equipment strewn about, as this poses a safety hazard in the Salle and a theft opportunity at competitions. Prior to departing a venue each fencer will check to ensure that all of their equipment is properly stowed in the fencing bag and that wet clothing is separated from weapons and electrical components. 14. Scouting and Debriefing: After a competition, each participant is expected to complete and submit electronically a self-assessment that identifies specific strengths on which to build and specific weaknesses that require work. In addition, fencers are expected to use their meet logs to complete scouting reports on each opponent fenced. The information from these two reports is used to guide both individual and team training, and is a critical part of our competitive program. 15. Competition Analysis: After each tournament the coaching staff prepares an individual analysis of the statistical performance of each fencer in the event and discusses this with the athlete. These are used to guide training, and fencers are responsible for being able to identify, and train to eliminate, performance issues identified in the statistics. b. Walpurgis Cup: The Salle weapons squad with the greatest cumulative number of pool bout seeding points in class sessions is awarded the Walpurgis Cup annually at the end of the fencing year. c. Iron Man: The Salle member who fences the most practice bouts (including pool and direct elimination) and the Salle member who achieves the highest total of seeding points in class pool bouts during the fencing year are declared the Salle Iron Men. The cumulative results of each week’s competitions during a month are used to seed the following week’s pool and direct elimination bouts. The first week of a new month is seeded based on the seeding at the end of the previous month. a. Service: Members who complete one year of membership are awarded the Salle’s service certificate and pin for each year of membership. b. Achievement: Members who make a significant contribution to the Salle’s mission or who achieve significant competitive success are awarded the Salle Coin at the discretion of the Salle Maitre d’Armes. Less distinctive, but still meritorious, service or competitive success is recognized by award of the Salle lapel pin. 19. Replacement Awards: We do not believe gag trophies, trophies repurposed from other sports, rubber ducks, plastic drinking cups, fantasy or pocket knives, or large sword like objects are appropriate recognition for fencers who reach the final rounds (quarter-final round of 8, semi-final round of 4, or gold medal bout) in competitions. These demean the sport or are actually dangerous. Any member receiving such an award may request that the Salle issue a Salle medal in the appropriate metal as a replacement in trade for an inappropriate award. 20. Staff: Individuals who provide instruction or training in the Salle are required to be professionally certified by the United States Fencing Coaches Association, the Academie d’Armes Internationale, the International Fencing Coaches Association, or the Classical Academy of Arms, and to be members of the United States Fencing Coaches Association and professional members of USA Fencing. The Salle conducts training for its members interested in becoming certified professionals, and individuals in training may provide instruction under the supervision of a certified professional. Individuals in training provide instruction as part of their development of the knowledge, skills, and abilities required to gain professional certification and their training in the duties of a professional trainer. 21. Expected Conduct in the Salle: Fencers fencing in the Salle and in competitions must always be guided by the principles of courtesy and sportsmanship. Failure to do so is inconsistent with our values. Hard hitting, brutality, yelling, or taunting opponents will not be tolerated. All members are responsible for reading and abiding by the guidance in our Values and Customs of the Salle brochures. 22. Facility Cleanliness: Every member is responsible for cleanliness and order in the Salle. Anyone observing trash in the facility should pick it up and deposit it in a trash can. Water bottles that have not been completely emptied should be emptied outside and deposited in a trash can without being capped so that we do not trap water in landfills. Members at tournaments will dispose of any trash that they generate, including water bottles and food wrappers. 23. Emergency Procedures: The Salle has a detailed emergency plan with copies located in the office and on the fencing floor. In case of injury or other emergency, the senior coaching staff member present will assume command and direct appropriate response actions according to the plan. The plan is exercised randomly at least twice a year to ensure that it remains current, and to familiarize our members with the procedures.